Amazon’s Echo has you pretty well covered for audio from services like Pandora and Prime Music, but you can also connect your mobile device via Bluetooth. Amazon’s Echo smart speaker is a unique device that you can do some cool things with. One thing you might want to do is connect your smartphone or tablet via Bluetooth, and then stream music from a service like Spotify or iTunes to your Echo. 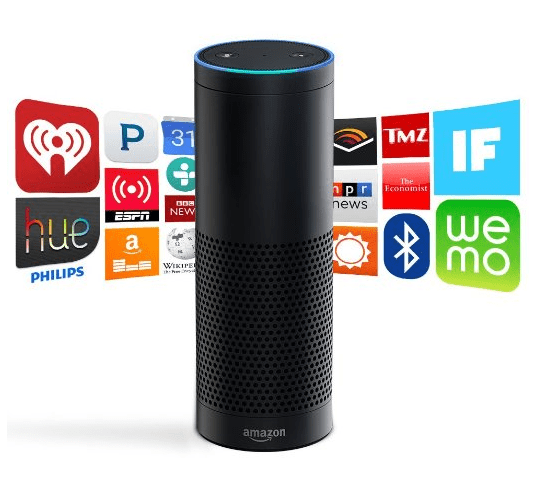 The Amazon Echo already has you pretty well covered for audio. You can already play music directly on it from Amazon Prime Music, radio stations, Audible, and podcasts via iHeartRadio or TuneIn, and by connecting Pandora. But you might have other audio that isn’t available on those services and need to connect your device. There are a couple of ways you can pair your Bluetooth device to the Amazon Echo, either by voice (using Alexa) or its web interface. To use your voice, say “Alexa Pair” and it will respond with “Ready to pair, to the Bluetooth settings on your mobile device and choose Echo-###.” Each Echo will have a different identification number. 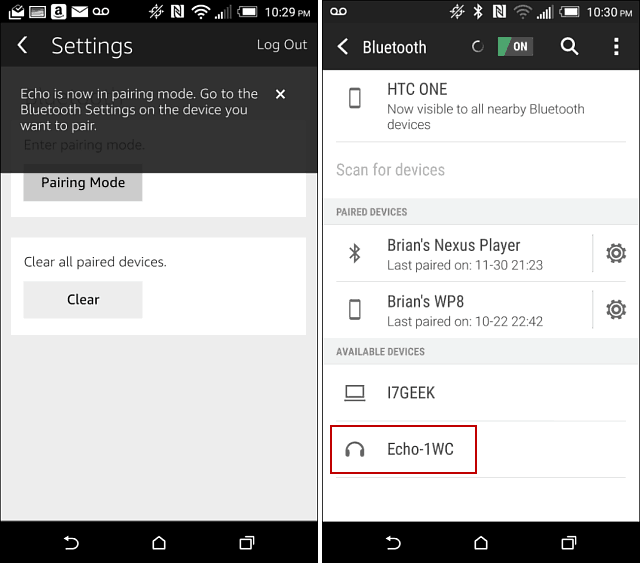 If you’re using the app or web interface, go to Settings > your echo’s name > Bluetooth > Pairing Mode. In this example, I am using an HTC One (M8), so you get an idea of what it’s like on different devices. 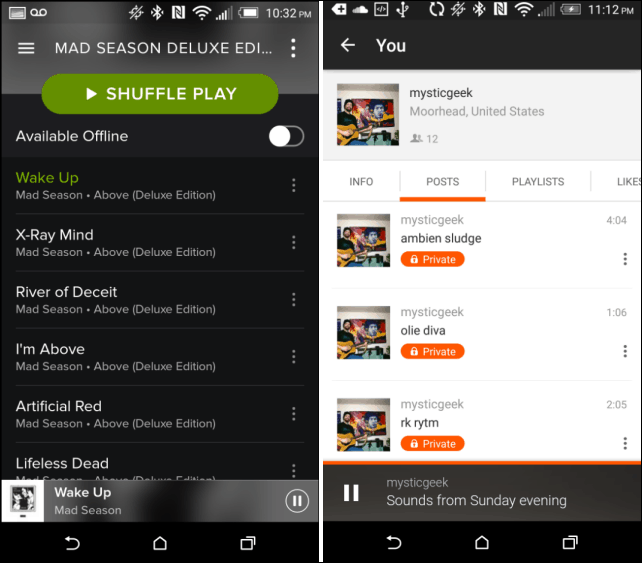 Either way, pair your device (by voice or app), and once the connection is established, you can start streaming your tunes or whatever audio you have over to the Echo from your favorite audio service. When you’re done using everything, just say “Alexa disconnect,” and it will stop the connection from your smartphone or tablet. Note: Currently you can only stream content to the Echo. You can’t receive audio from it to Bluetooth headphones or speakers. Also, phone calls or text messages can’t be sent to the Echo for Alexa to read to you. If you have paired multiple devices, it will pair with the most recent one you used. Amazon recently made the Echo available to everyone without an invite and opened it to third-party developers. So we hope to see some exciting new features coming to the device soon. For more tips and tricks check out our archive of Echo articles. You can download the Echo app for different devices from the links below. I have just purchased a bluetooth headphones Mixcder ShareMe 7 from Amazon. I was hoping to connect this bluetooth device (headphones) to Echo. I wanted to listen and talk to Alex via this headset. is that possible? My echo tells me it is connected to my phone but I can’t play my iTunes. I don’t want to have to buy an amazon product or music to be able to play. How can I get the music on my phone to play on my dot?